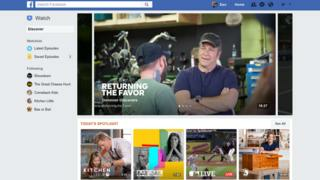 Social media giant Facebook has made a move into dedicated video, pitting it against YouTube and TV networks. Watch will be personalised so that users can discover new shows, based on what their friends are watching. Viewers will also be able to see comments and connect with friends and dedicated groups for shows. "Watching a show doesn't have to be passive," said the company's founder Mark Zuckerberg in a Facebook post. "It can be a chance to share an experience and bring people together who care about the same things." Video has been available on Facebook for some time, but until now, it has mostly been dominated by amateur clips or short segments from news organisations. The world's largest social network added a video tab last year, and has hinted for some time that it might make the move to producing original content. Watch could open up new revenue potential for both Facebook and programme makers, while users can expect to see targeted advertising before and during the shows. Facebook says it hopes its selection of shows will address both niche and broad interests. If the choice at launch is anything to go by, its focus will be factual entertainment - cookery, fitness and travel-themed programmes that play well on a smartphone screen, rather than flagship dramas like House of Cards or Game of Thrones, which are both more expensive to produce and better suited for playback on TVs. Product director Daniel Danker - an ex-BBC iPlayer executive - told me that his goal was for anyone to be able to make shows for Watch. For now, only a small set of approved publishers can include ad breaks, but he said the list would broaden over time, although it was too soon to say if it would extend to all. That could prove critical to wooing content-makers away from YouTube. For the moment, Google's video streaming site still offers an easier way for popular vloggers and others outside the mainstream media industry to make money from their efforts. But Mr Danker signalled that Facebook is willing to take its time exploring what works on Watch and would not even commit to it being rolled out beyond the US before the end of the year. Facebook is entering an increasingly complex and crowded market, and will face competition from traditional TV networks as well as other online services like YouTube and Netflix. Disney yesterday announced that from 2019, it will scrap its existing deal with Netflix and create its own direct-to-consumer streaming-video services. It will also set up a sports-themed ESPN streaming service next year. Facebook already has content lined up, including Major League Baseball, Women's basketball, parenting shows and a safari show from National Geographic. According to Reuters news agency, it has also inked deals with millennial-oriented media groups Vox Media, BuzzFeed, ATTN, Group Nine Media and others to produce shows. Watch will have a limited release in the US before it is rolled out more broadly.